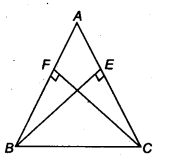 NCERT Solutions for Class 9 Maths Chapter 7 Triangles Ex 7.1 are part of NCERT Solutions for Class 9 Maths. 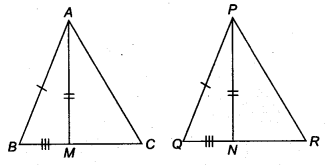 Here we have given NCERT Solutions for Class 9 Maths Chapter 7 Triangles Ex 7.1. 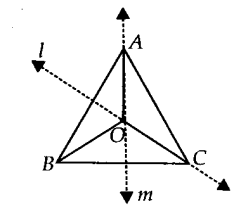 In quadrilateral ACBD, AC = AD and AB bisects ∠ A (see figure). Show that ∆ABC ≅ ∆ABD. What can you say about BC and BD? 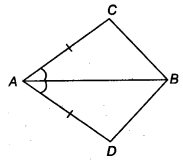 In quadrilateral ACBD, we have AC = AD and AB being the bisector of ∠A. 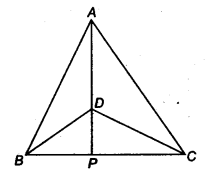 AD and BC are equal perpendiculars to a line segment AB (see figure). Show that CD bisects AB. i.e., O is the mid-point of AB. l and m are two parallel lines intersected by another pair of parallel lines p and q (see figure). Show that ∆ABC = ∆CDA. (ii) BP = BQ or B is equidistant from the arms ot ∠A. We have, l is the bisector of ∠QAP. Thus, the point B is equidistant from the arms of ∠A. In figure, AC = AE, AB = AD and ∠BAD = ∠EAC. Show that BC = DE. We have, P is the mid-point of AB. Since M is the mid – point of AB. But they form a pair of alternate interior angles. In ∆ABC, AD is the perpendicular bisector of BC (see figure). Show that ∆ ABC is an isosceles triangle in which AB = AC. Since AD is bisector of BC. Thus, ∆ABC is an isosceles triangle. 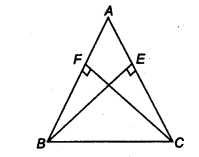 ABC is an isosceles triangle in which altitudes BE and CF are drawn to equal sides AC and AB respectively (see figure). Show that these altitudes are equal. ∆ABC is an isosceles triangle. 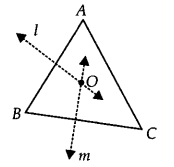 ABC is a triangle in which altitudes BE and CF to sides AC and AB are equal (see figure). 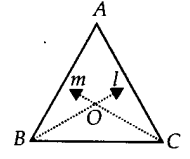 (ii) AB = AC i.e., ABC is an isosceles triangle. ⇒ ABC is an isosceles triangle. 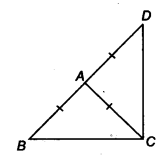 ABC and DBC are isosceles triangles on the same base BC (see figure). Show that ∠ ABD = ∠ACD. ∆ABC is an isosceles triangle in which AB = AC. Side BA is produced to D such that AD = AB (see figure). Show that ∠BCD is a right angle. 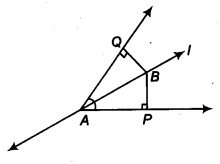 ABC is a right angled triangle in which ∠A = 90° and AB = AC, find ∠B and ∠C. ∴ Their opposite angles are equal. Show that the angles of an equilateral triangle are 60° each. ∴ AP is the bisector of ∠A. ∴ AP is the bisector of ∠A as well as ∠D. Hence, AP is the perpendicular bisector of BC. ⇒ D is the mid-point of BC or AD bisects BC. In ∆ABC, AM is the median. In ∆PQR, PN is the median. ∴ ABC is an isosceles triangle. ABC is an isosceles triangle with AB = AC. 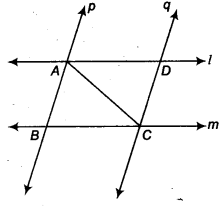 Draw AP ⊥ BC to show that ∠B = ∠C. Therefore, we get AC is the longest side. But AC is the hypotenuse of the triangle. Thus, the hypotenuse is the longest side. In figure, sides AB and AC of ∆ABC are extended to points P and Q respectively. Also, ∠PBC < ∠QCB. Show that AC > AB. In figure, ∠B <∠ A and ∠C <∠ D. Show that AD < BC. 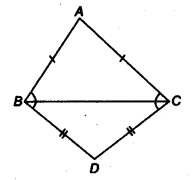 AB and CD are respectively the smallest and longest sides of a quadrilateral ABCD (see figure). Show that ∠ A > ∠C and ∠B >∠D. Similarly, by joining BD, we have ∠B > ∠D. In figure, PR > PQ and PS bisect ∠QPR. Prove that ∠PSR >∠PSQ. From (1), (2) and (3), we have PM is the smallest line segment drawn from P on the line l. Thus, the perpendicular line segment is the shortest line segment drawn on a line from a point not on it. ABC is a triangle. Locate a point in the interior of ∆ ABC which is equidistant from all the vertices of ∆ ABC. Let us consider a ∆ABC. Draw l, the perpendicular bisector of AB. Draw m, the perpendicular bisector of BC. 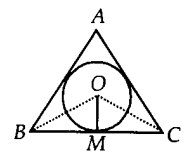 Let the two perpendicular bisectors l and m meet at O.
O is the required point which is equidistant from A, B and C.
Note: If we draw a circle with centre O and radius OB or OC, then it will pass through A, B and C. The point O is called circumcentre of the triangle. Draw m, the bisector of ∠C. Let the two bisectors l and m meet at O. Thus, O is the required point which is equidistant from the sides of ∆ABC. Note: If we draw OM ⊥ BC and draw a circle with O as centre and OM as radius, then the circle will touch the sides of the triangle. Point O is called incentre of the triangle. A: where these are different slides and swings for children. B: near which a man-made lake is situated. C: which is near to a large parking and exist. Where should an ice-cream parlor be set? up so that maximum number of persons can approach it? Let us join A and B, and draw l, the perpendicular bisector of AB. Now, join B and C, and draw m, the perpendicular bisector of BC. Let the perpendicular bisectors l and m meet at O. The point O is the required point where the ice cream parlour be set up. Note: If we join A and C and draw the perpendicular bisector, then it will also meet (or pass through) the point O. Complete the hexagonal and star shaped Rangolies [see Fig. 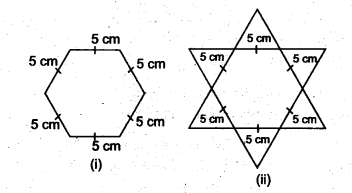 (i) and (ii)] by filling them with as many equilateral triangles of side 1 cm as you can. Count the number of triangles in each case. Which has more triangles? We require 150 equilateral triangles of side 1 cm in the Fig. (i) and 300 equilateral triangles in the Fig. (ii). ∴ The Fig. (ii) has more triangles. 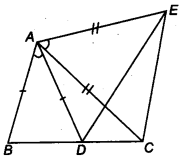 We hope the NCERT Solutions for Class 9 Maths Chapter 7 Triangles Ex 7.1 help you. If you have any query regarding NCERT Solutions for Class 9 Maths Chapter 7 Triangles Ex 7.1, drop a comment below and we will get back to you at the earliest.